Unabridged & Original version Includes: 21 Colored Illustrations and Biography Pride and Prejudiceis a novel of manners by Jane Austen, first published in 1813. The story follows the main character, Elizabeth Bennet, as she deals with issues of manners, upbringing, morality, education, and marriage in the society of the landed gentry of the British Regency. Elizabeth is the second of five daughters of a country gentleman living near the fictional town of Meryton in Hertfordshire, near London. Page 2 of a letter from Jane Austen to her sister Cassandra (11 June 1799) in which she first mentions Pride and Prejudice, using its working title First Impressions. (NLA) Set in England in the early 19th century, Pride and Prejudice tells the story of Mr and Mrs Bennet's five unmarried daughters after the rich and eligible Mr Bingley and his status-conscious friend, Mr Darcy, have moved into their neighbourhood. While Bingley takes an immediate liking to the eldest Bennet daughter, Jane, Darcy has difficulty adapting to local society and repeatedly clashes with the second-eldest Bennet daughter, Elizabeth. 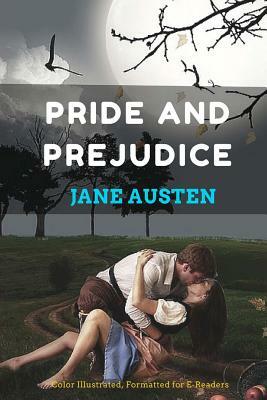 Pride and Prejudice retains a fascination for modern readers, continuing near the top of lists of "most loved books." It has become one of the most popular novels in English literature, selling over 20 million copies, and receives considerable attention from literary scholars. Modern interest in the book has resulted in a number of dramatic adaptations and an abundance of novels and stories imitating Austen's memorable characters or themes. The novel centres on Elizabeth Bennet, the second of the five daughters of a country gentleman. Elizabeth's father, Mr Bennet, is a bookish man, and somewhat neglectful of his responsibilities. In contrast Elizabeth's mother, Mrs Bennet, a woman who lacks social graces, is primarily concerned with finding suitable husbands for her five daughters. Jane Bennet, the eldest daughter, is distinguished by her kindness and beauty; Elizabeth Bennet shares her father's keen wit and occasionally sarcastic outlook; Mary is not pretty, but is studious, devout and musical albeit lacking in taste; Catherine, sometimes called Kitty, the fourth sister, follows where her younger sister leads, while Lydia is flirtatious and lacks maturity. The narrative opens with news in the Bennet family that Mr Bingley, a wealthy, charismatic and sociable young bachelor, is moving into Netherfield Park in the neighbourhood. Mr Bingley is soon well received, while his friend Mr Darcy makes a less favourable impression by appearing proud and condescending at a ball that they attend (he detests dancing and is not one for light conversation). Mr Bingley singles out Jane for particular attention, and it soon becomes apparent that they have formed an attachment to each other. While Jane does not alter her conduct for him, she confesses her great happiness only to Lizzie. By contrast, Darcy slights Elizabeth, who overhears and jokes about it despite feeling a budding resentment. On paying a visit to Mr Bingley's sister, Caroline, Jane is caught in a heavy downpour, catches cold, and is forced to stay at Netherfield for several days. Elizabeth arrives to nurse her sister and is thrown into frequent company with Mr Darcy, who begins to act less coldly towards her. The novel closes with a "happily-ever-after" chapter including a summary of the remaining lives of the main characters. None of the characters change very much in this summary, but Kitty has grown slightly more sensible from association with Jane and Elizabeth and distance from Lydia, and Lady Catherine eventually condescends to visit the Darcys.